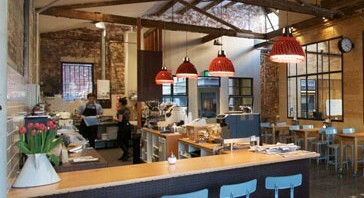 At Seven Seeds roasting warehouse-cafe we get to smell, see and taste the experiments of coffee boffin Mark Dundon. And it’s quite the mad scientist experience. There are coffee plants on display, antique roasting machines, windows through to the cupping room, and siphon and clover coffees on offer. Converted warehouse chic heightens the funky laboratory feel – along with the excitement of knowing your beans are batch-roasted right behind that wall. The menu is short and sleek, but it’s really about the coffee. Slick little espressos of the house blend are expertly extracted to perfect each tiny cup. It’s thick and viscous, wafting woody, earthy notes with a hint of pine before exploding in the mouth. A lively acidity runs across the palate, to finish with a hint of spice – and I want to hug the barista. A luscious latte to follow is more muted, but still a joy. Grab a bag to take home and maybe add a Phat Tony blend to the mix. Protective glasses sold separately. This entry was posted in testcat and tagged 5 beans, cafe design, roaster, seven seeds. Bookmark the permalink.